I nearly bought these trousers the other day! They remind me so much of the kinds we saw while travelling in Asia (though these ar about 20 times the price!). However, seeing how you've styled them is fabulous. :) Printed trousers are so diverse, I'm a big fan of the looks you've produced!! these pants are super pretty and so versatile! love the elephant print and how you paired it! All of these looks are my favourite! I love the trousers! They're SO cute, and I think they really suit you! I need to get some loose pants!! I might try that sea salt spray seeing as I haven't had much luck with other ones I've tried! I saw a similar trouser in Forever 21 just a couple of days ago! You're making me regret that I didn't buy it! The 2nd outfit is definitely my favourite, I love the pink jacket! 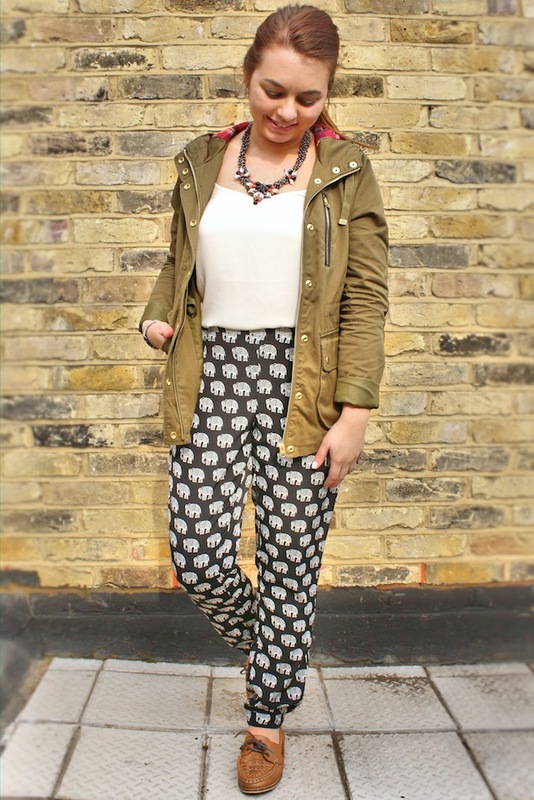 Love those trousers, and your blog's new look. I love the second outfit & the trousers! Oooooh loving those pants! Adore! I love these trousers! they're too cute, and I love how you've styled them. This is really awesome! I love all three looks, though I think my favourite is the first! I also really love elephants, so this post is just amazing. Love these trousers so much!! I've been eying them up every time I'm in Topshop! The third outfit it my favourite, I love it! Love printed trousers, these are so cute! Lovely outfits! Love outfit 3! And these pants are so lovely! This kind of post is awesome! omg elephants on trousers. amazing!! I'm loving your idea of making up three outfits in your head before buying it. I'm der gonna start doing that and hopefully it will stop be over buying. Oh my! So cute! I like each outfit, elephants are the cutest! It is great to see a post like this because as the trousers have a bold pattern it is nice to see how you could wear it in a variety of ways! Helpful posts are the best!